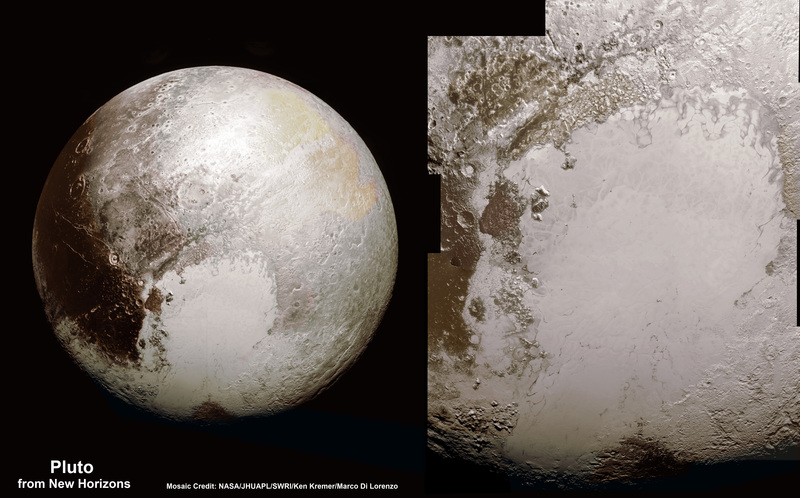 That lead photo has me wondering if that by itself was worth the cost of the New Horizons mission. Just wow. After doing some image searches of ripples in various substances (mud, ice, etc. ), I find that the parallel ripples which sometimes form across glaciers on Earth are similar, but still not close enough for my taste to explain these features. To my (admittedly untrained) eye, it appears that those “ripples(? )” post-date at least a handful of large impact craters, suggesting an ongoing process. My imagination conjures a persistent regional wind field which is either ablating/melting solid material and then immediately re-depositing it on downwind surfaces, or perhaps simply sculpting semi-solid ices directly into the fantastic shapes we’re seeing. Either way, I can’t get the image of rain moving up/across the windshield of a moving vehicle out of my head. And for the life of me, as I look at more & more images of Sputnik Planum I cannot get past the thought of raspberry ice cream melting into a root beer or cream soda float. Too weird. So awesome. Please tell me there is a green channel and they just haven’t downloaded it yet. Answering my own question: they already knew there was so little green they didn’t bother packing a filter. Green could be gotten by subtracting red and blue from the broadband white channel, if there was any to be had. Specifically, MVIC maps blue (400-550 nm), red (540-700 nm), near IR (780 – 975 nm) and narrow band methane (860 – 910 nm). It’s absolutely wonderful, IMO that the last of the “Classic 9” turns out to be ANYTHING but the least! I wonder if (m)any of these unique features will be present on 2014 MU69..? Perhaps such landforms are more common that far out due to the extreme virtually Sol-less environs? ~~~ Or perhaps it’s the outline of part of the Elder God that slumbers there dreamless’ unspeakable, Aeuclidian hide…? Jaw-droppingly amazing image! I agree with Smokey: the rippled texture is just like rain moving diagonally up the windscreen of a fast-moving car. It also reminds me of the effect you sometimes get when you’re covering a brick wall with gypsum plaster that is too moist and you try to smooth it down with a wet spatula. With the spatula still sliding sideways, you lift it off the surface and get a very similar effect. (Someone forgot to sand that part down.) Just look at the jagged shadows of the ripples in that low-lying smooth grey patch to the right of centre and down a bit (the largest grey patch). The ripples are really high! Grab your snowboard and head for those Plutonian tubes. Great flash-back barometer! I bet he’d have a poo-hemorrhage today! Fascinating! Rough terrain punctuated by very smooth areas. To me it looks like dunes and frozen lakes. 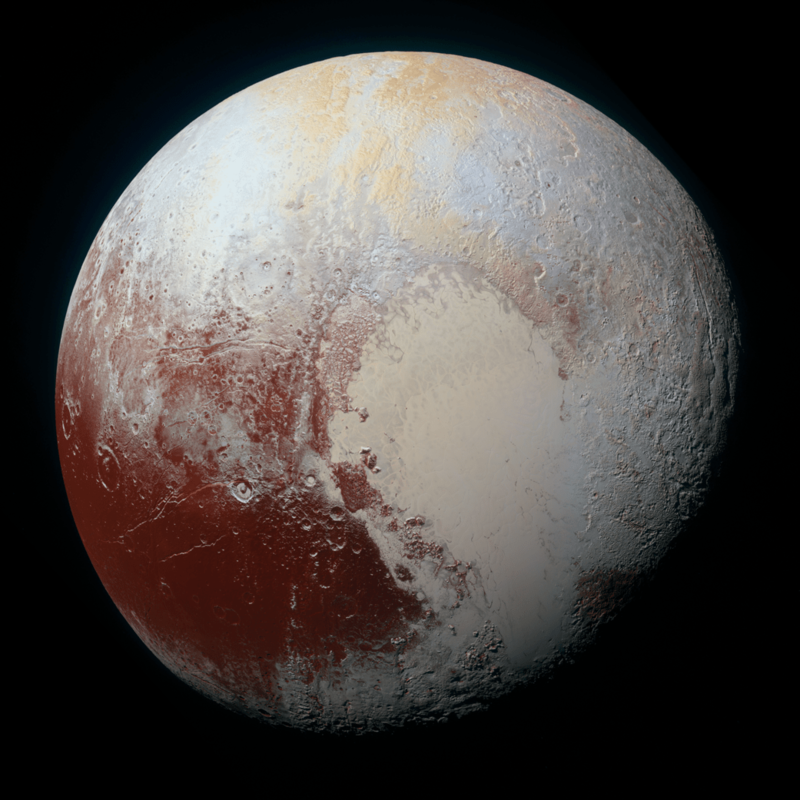 Considering Pluto’s seasonal meteorological variations maybe that’s what this is. Amazing pictures. Big hand to all those who made this project happen. we can still look forward to probes at some future date for the KBOs. i’d like to be alive to witness a sedna mission (doubtful), or whatever significantly sized object becomes the most distant yet discovered. Actually, I see very similar structures each spring, when the piles of dirty snow melt in the heat of the sun and create these intricate structures. Maybe something to do with the sun heating different materials, sublimating some away, while others remain. Previous PostPrevious Is the Universe Dying?